Human Machine Interaction In Operating Room | NZ Technologies Inc.
TIPSOTM, encompassing two products, TIPSO AirPadTM and TIPSOTM Beam, is an award-winning Human Machine Interface (HMI) platform for interventionalist and surgeons who need to efficiently interact with radiology images in the Operating Room (OR). It is designed to fit seamlessly in their challenging work environment. TIPSO’s novel touchless user interfaces enable a surgeon to access and control radiology images (PACS or intra-procedural imagery) without the inconvenience of leaving the OR’s sterile environment or having to carry out lengthy communication with a technician to delegate the task. 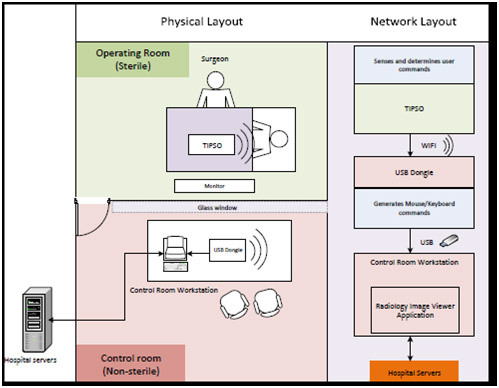 TIPSO accomplishes this by sensing a user’s hand and finger motions and translating to keyboard/mouse commands that are then wirelessly communicated to a computer workstation to manipulate the radiology images. 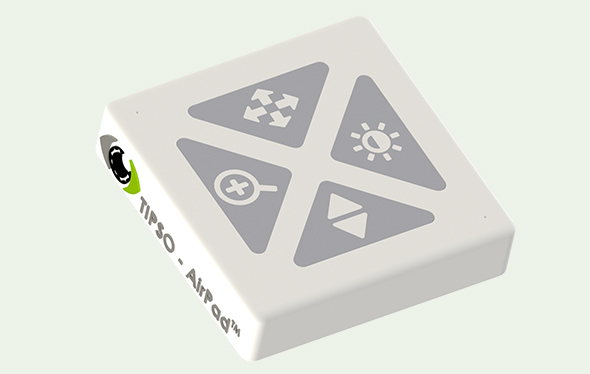 Designed from the ground up, the TIPSO AirPadTM is a proprietary human-machine interface completely independent of Beam. 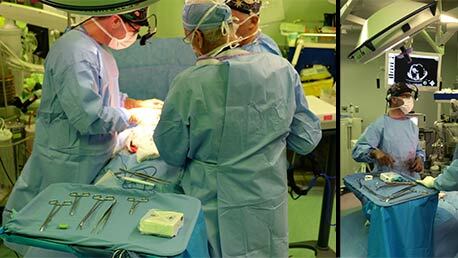 It is small and portable, allowing practitioners to manipulate patient images in crowded operative scenarios. The AirPad houses a custom-designed short-range capacitive sensor that can operate wirelessly and track finger motion and simple gestures. Three different hand motions can be employed to interact with the TIPSO AirPadTM hand swipes (up, down, left, right), finger movement over the pad, and finger rotations (clockwise, counter-clockwise). Tapping any of the four distinct regions on TIPSO AirPadTM, namely zoom, scroll, pan, and window/level, will activate that particular mode. TIPSO AirPadTM can be placed inside a sterile bag before the surgery and placed anywhere convenient on the surgical bed. A camera + sensor unit projects a virtual menu onto a chosen surface to enable intuitive image manipulation control. The manipulation is actuated through simple hand-hover and finger-tap actions akin to a virtual tablet-like experience. The system gathers sensor data (i.e. the so-called 3D point cloud of the surgeons hand and the surface below it) and analyzes the users hand motions, with respect to the projected user interface, using proprietary 3D image processing algorithms and software. It then processes them into intuitive PC mouse and keyboard controls. 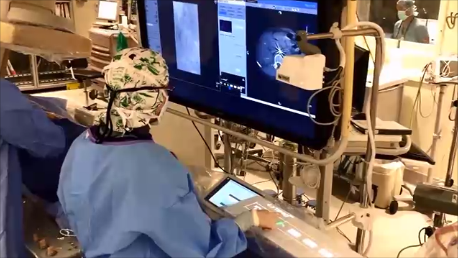 Then, by way of a proprietary USB Dongle connected to the operative workstation, Beam communicates these controls to enable the surgeon to navigate radiology images. 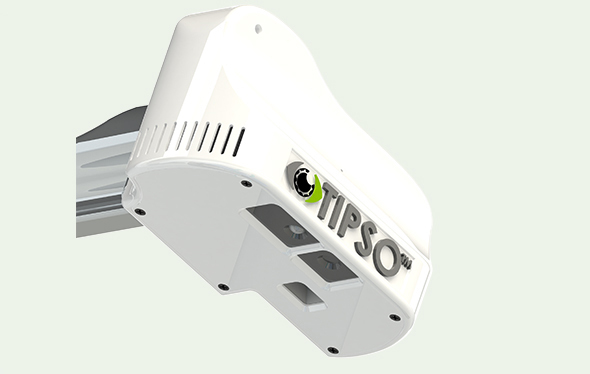 The purpose of TIPSO’s USB Dongle is to simply facilitate this data transmission and actuate the necessary mouse and keyboard commands on the control room workstation. A control room, separated by a glass-panelled wall, hosts one or more computer workstations with patient medical data. By connecting the USB Dongle to the workstation and setting up a wireless router for WIFI communications, TIPSO can wirelessly control radiology images on the chosen workstation. While not all ORs have a designated control room, an area is always designated for non-sterile access to a computer workstation. TIPSO is viewer-independent; the relevant mouse and keyboard controls sent from TIPSO to the workstation can be configured for any given Radiology Image Viewer Application (provided by vendors, such as Philips, Siemens, or McKesson).